Most of household appliances are using direct current to run its internal circuitry, even efficient motors are now controlled by DC drivers. Photo-voltaic panels are more affordable and easy to use on family house roof. In order to this situation there should be no reason to change direct to actuated current and back in single house. Actuated current (AC) will be still needed in last mile electricity grids because of low losses on small diameter cables. Direct current needs thicker cables proportional to length, but modern appliances are energy efficient and distance is not critical for most of new family houses. In order to that there is no sense to switch up DC to AC than rectify back wasting energy this way to heat. 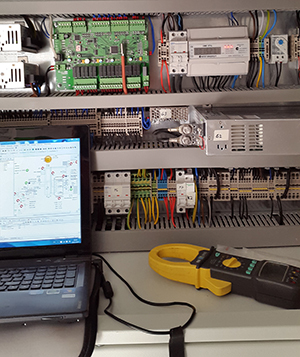 We where able to build full-fledged HVAC, PV, Light, home automation solution build on DC components. LED lights, DC compressors, fans, solenoids valves. Our system was able to cover PV production, battery storage, air heating, air cooling, domestic hot water, LED lights, air exchange and also some small appliances like fridge or freezer. Whole house was backed up with one AC-DC power supply, this source was used only when self-produced energy was not enough co cover actual demands. System was able to automatically switch between self produced electricity and electricity provided by backup supply. Heat pump unit was build from ground up by our company, together with control system and battery storage. Air exchange was done as cooperation Czech leading company Atrea. LED and other appliances was used from of the shelf components. Patent no. 2014-30120 (Equipment for integrated system of a building energy self-sufficiency) was granted. We installed our system in four newly build family houses starting form year 2013 to 2016, two of them are still using it. System was awarded in 2015 by Czech Ministry of Industry and Trade together with Ministry of the Environment. We was not able to compete by price with of the shelf AC components and appliances, some components was not simply available on the market. 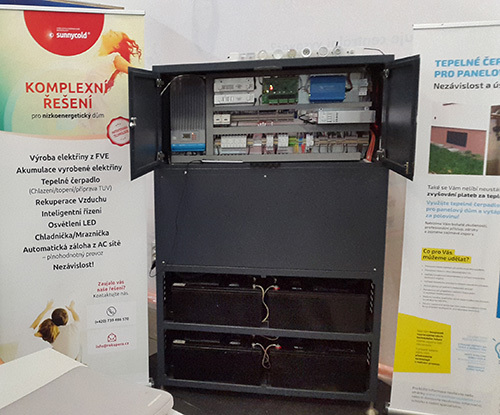 Most powerful compressor on the market was used in trains with maximum output of 3kW and was not prepared for parallel connection. 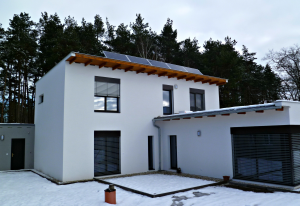 Minority of houses in middle Europe conditions have heat losses lower than 3kw, so we where forced to use two compressors facing oil distribution problems, issues of driving two compressors with DC rivers in tandem. Standard parallel connected compressors run AC 50Hz, so they produce vibration moving on same vector. DC drives was hard to synchronize, which cause noise and vibration problems. House hold appliances where hard to find, price was large and design was poor. Whole process assisting and putting all kind of technology to the house during construction work of the house takes time efforts which we was not able to cover from our margin. In process where able to fix most of challenges we had, but market was not ready, so we had to put this project on hold, taking our knowledge and skills to our Airsun product line which perfectly fits to today market. What voltage? Nominal 48V system goes up to max 60V DC which is considered in most countries as safe. Nominal voltage is usually multiplier of 12V. Higher voltage than 60V DC is considered as unsafe and legislation is uncertain about how to deal with it in family houses. There is no common DC voltage level that cover all appliances. LED light are usually 12V DC which is to low for driving compressors rising currents flowing in circuits. System still need boost or step down DC-DC conversion. Is cheap DC-DC more efficient than DC-AC? AC components are on the market between pressure from large competition, pushing price down and quality up. High power high efficiency DC-DC is expensive and hard to find. At the end of day cheap DC house can be same or more inefficient than standard AC house. Those and other really challenging topics are open and will need more research in all aspects in order to be sure if DC house really worth-it. DC house can completely change market as we know now. No circuit breakers, voltage protection, surge protection and other, everything will be integrated in power supply circuits. Higher integration with photo-voltaic plants. Most electronics like notebooks, TVs and monitors start to use external power adapter (AC-DC) which can be totally discarded in the future. Sunnycold was able to gather wide knowledge in real DC house applications and own in house research and development. We are open to share our knowledge with any partner coming from science or business willing to expand those ideas and products.